The Fantasy (Fantasia) for piano, vocal soloists, chorus, and orchestra, Op. 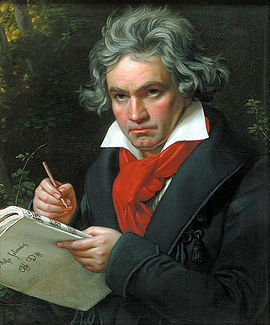 80, was composed in 1808 by Ludwig van Beethoven. The most popular vocal score for Beethoven's Choral Fantasia is shown below. The Novello edition of Beethoven's Choral Fantasia is in English for SATB. The Fantasia op. 80 (or “Choral Fantasy”) was first performed at the Akademie (benefit concert) of 22 December 1808, which also saw the premières of the Fifth and Sixth Symphonies as well as a performance of portion of the C major Mass. To conclude this memorable concert program, Beethoven wanted a “brilliant Finale” that would unite in a single piece the different musical elements highlighted in the concert night: piano solo, chorus and orchestra. The Fantasia op. 80, written shortly prior, was thus written expressly to fulfill this role. Beethoven himself played the piano part and the opening solo offers an example of his improvisational style (at the première he did, in fact, improvise this section). The piece, however, is best known for an early version of that simplice theme that Beethoven would later use as the melodic line for the Ode to Joy theme in the Ninth Symphony. The text was provided by the poet Christoph Kuffner with Beethoven's input. The theme – universal fraternity with the meetings of arts – also foreshadows Schiller's "Ode to Joy". This, along with the strong musical similarities, means there is an obvious connection between the Fantasia op. 80 with the finale of the 9th Symphony. Within an original scheme of key-relationships, the variations are both simple and subtle. (This part of the work is also linked with two pieces for solo piano, the Variations in op.34, and the Fantasia op.77.) The entry of the chorus, intoning a poem in praise of song, is actually a very lengthy coda to the variations. The formal freedom of the Fantasia genre allowed Beethoven to unify in a short length piece the intimate aspect of piano and chamber music, and the grandiose aspect of symphonic music with choral. The Fantasia, dedicated to King Maximilien 1st Joseph of Bavaria, was Beethoven's penultimate work with solo piano and orchestra. A few months later, he composed the 5th Concerto, where he maintained an opening cadenza in an improvisational style. Presto where the chorus enters. The Fantasy opens with a slow but virtuosic 26-bar piano introduction, modulating from C minor to C major and back again. The main part of the piece, marked "Finale", begins with an Allegro theme played by the cellos and basses. Next, the solo piano introduces the choral theme in an ornamented version. Variations on the theme are then played by the flutes, oboes, clarinets, and string soloists, respectively. A full orchestral version of the theme, played at a forte dynamic leads into a more lyrical piano line. The orchestra accompanies an eighth-note heavy piano part as the piece modulates from C minor to C major. A calm, flowing A-major section, ending with a call-and-response section between double reeds, horn, and piano, leads into the Marcia, an F-major variation on the main theme in march style. A reprise of the instrumental theme from the first Allegro transitions into the choral entrance. The chorus enters with the sopranos and altos singing the main theme, harmonized in triads. The tenors and basses then sing the theme, after which the entire chorus is joined by the orchestra in a tutti rendition, restating the major theme with each time a faster pace. A presto coda with orchestra, chorus, and piano brings the piece to a triumphant close, ending with a flourish of high C Major arpeggios on the piano. If you wish to have a CD of Choral Fantasia to hear the whole work please click here and please do click on the video below to listen right away if you wish.